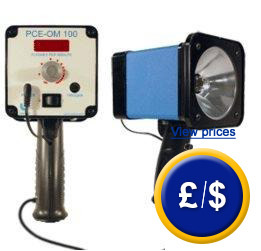 The PCE-OM 100 stroboscope is handheld and can capture the motion and measure the velocity of objects. The stroboscope is powered by 230V. It's ideal for checking revolutions, the rotation of cogged wheels, motors, centrifuges and for the inspection of production lines. It can be used manually or be mounted on a tripod. A trigger input is available separately and allows the user to use the stroboscope to machinery in ways that were not possible before. If you are looking for a similar model but with rechargeable batteries, click here. Also, following this link will provide an overview of our range of stroboscopes to find one that fits your needs. By way of the trigger, the stroboscope can be easily controlled by hand, in measuring the velocity of an external machinery. It is connected via a 2-pin NPN connector which is compatible with a TTL connection. The flash's frequency by turning an adjustment knob, which is disabled while the Trigger is plugged into the device. A connection cable is available for the Trigger, just ask one of our technicians when placing your order. Range 120 to 6,000 r.p.m. Operating temperature 0 to 40°C / <95% r.h.